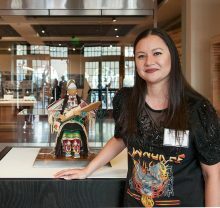 Jamie Okuma (Shoshone-Bannock/ Luiseño) was included in a list of 6 American Indian Fashion Designers profiled on Vogue.com. The article, titled, “How 6 Indigenous Designers Are Using Fashion to Reclaim Their Culture” also includes Kiowa jeweler Keri Autumbi. Both artists are regular exhibitors at the Heard Museum Guild Indian Fair & Market. Okuma won the 2018 Best of Show award for her soft sculpture, Protect, Honor, Cherish (pictured at right with the artist).